Have you started creating your Halloween cupcakes yet? Most Halloween cupcakes have Halloween candy on top or in the center, so I figured I would share ten facts about Halloween Candy from the National Confectioners Association. You can follow them on Twitter at @candyusa. Halloween confectionery sales projected to reach $2.5 billion in 2014. Baby Boomers rule. 84% of the 60+ generation plans to hand out Halloween candy this year. Men are both the most likely to play scary music and to hide and jump out at their visitors. 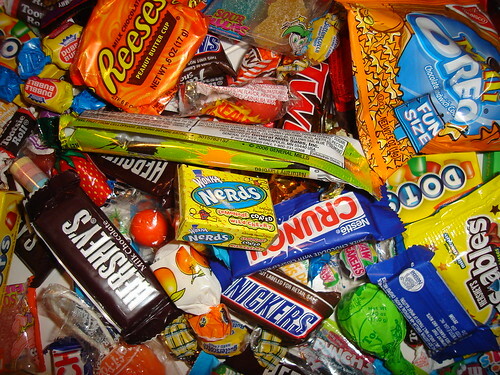 40% of parents say they limit their child’s candy consumption to a certain number of pieces per day until it runs out. The most Halloween enthusiasts come from the Midwest (79 percent). In the South, 76 percent will hand out sweets, followed by 74 percent in the West and 71 percent in the Northeast. Candy corn love. Only a slight majority believe candy corn is a must-have during the holiday. It is slightly more preferred by women (54 percent) than by men (50 percent). Millennials lead the pack for attending Halloween parties (51 percent) and dressing up in costume (47 percent). When their kids are away, 23 percent of parents pull a Halloween trick and sneak a few hard-earned treats. 70 percent of parents say they will take their children trick-or-treating!